Hello again, friends! I’m back after a short little Christmas break. Stuffed to the brim with excessive amounts of candy and Christmas cheer, I’m so excited to be back with y’all here on Lonestar Southern! With a show-stopper coat from Chicwish I’ve been dying to share with y’all. Hello, beautiful! The cut is what kills me. Such a classic, standout look! I’ve found that 3/4 length sleeves are universally flattering, and pair that with the structured neckline? Timeless, Jackie O elegance right here. As if that weren’t enough, the color is breathtaking! The perfect way to break up the oftentimes mundane hues of winter. I wore this exact outfit (you may remember this dress from last Christmas) to a friend’s wedding a couple weeks ago, and received compliments on this coat all night. I love that you can belt it shut or wear it open – both ways create their own, glam look! The older I get (and I realize I’m not speaking with much authority, but stick with me…) the more I realize that classic, striking pieces are the ones that build the foundation of personal style. A timeless red coat is something in past years I would have never thought to go out and buy, but has now become a closet favorite of mine. From New Years Eve to Valentines Day and even through the chilly first months of spring, I look forward to bringing out this beaut! For size reference, I’m in an XS. And heads up, it’s currently on sale and under $100! P.S. Y’all, Chicwish has got a thing for gorgeous outerwear. Do you remember this burgundy trench from this post last month? Still a favortie! This coat is adorable! It’s the perfect pop of color for winter! That belted coat is gorgeous!! Love it! Gorgeous coat and dress! You look so pretty! I love that color red on you! Also, the clutch is too adorable. I absolutely love that coat! It’s such a bold color but you wear it well! This outfit is so cute, Kate! So elegant and timeless! Happy New Year! The dress is gorgeous! 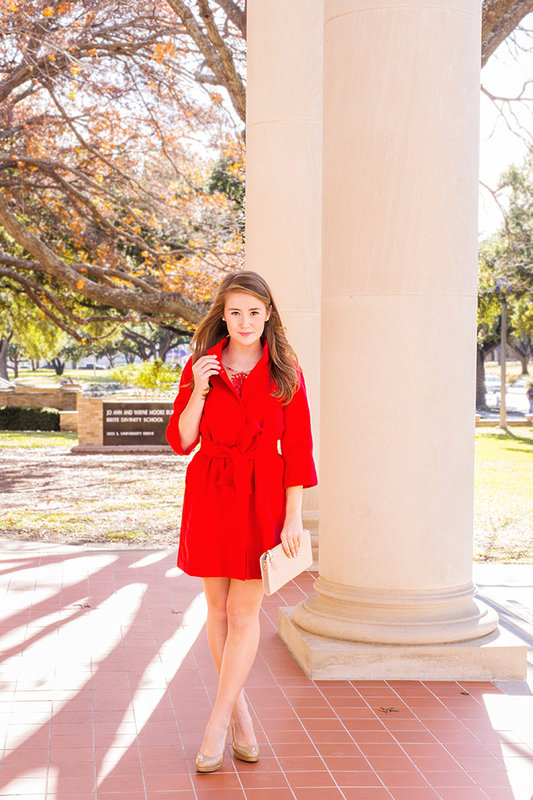 Love how you paired it with the red coat. In love with this jacket-the color is magnificent!